RAVEN STRATAGEM – Yoon Ha Lee (2017) | Weighing a pig doesn't fatten it. While I don’t really feel like it, I can’t but start this review with an opinion on a minor event in the blogosphere some time ago. 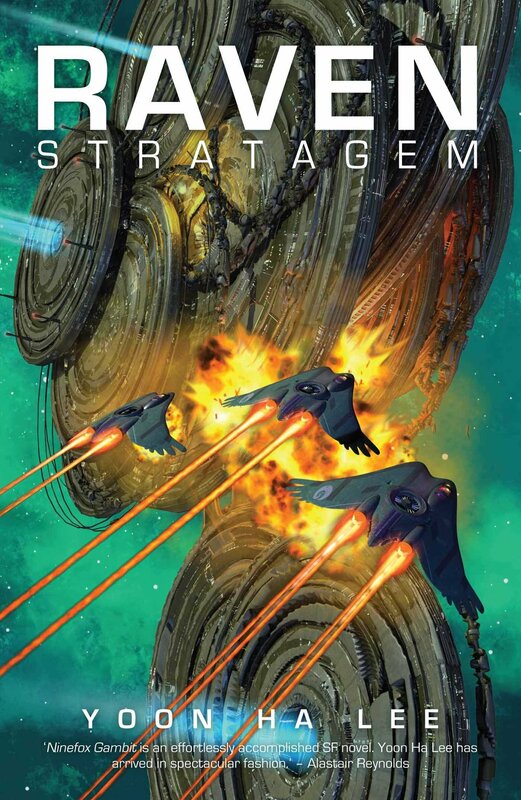 If you have no interest in a discussion of ethics in SF, and just want my opinion on Raven Stratagem, scroll down to the actual review at the very end. The first part of the text might also be of interest to those who haven’t read any of Yoon Ha Lee’s books, as the discussion is much, much wider than that. About a year ago, 3 people in the so-called Arthur C. Clarke Shadow Jury posted reviews about Ninefox Gambit, the first book of The Machineries Of Empire. Contrary to popular opinion – 9FG won the Locus for Best First Novel – those reviews were essentially negative, on what are essentially moral grounds. These three individuals are not marginal voices in SF fandom. Before most activity on her blog stopped – as she overdosed on commercially-hyped SF – Megan AM of From Couch To Moon was one the most respected and influential online reviewers of SF. Nina Allan is a speculative author herself: her most recent novel The Rift won the BSFA and the Red Tentacle. Jonathan McCalmont was shortlisted twice for the BSFA for best non-fiction writer, and writes for Strange Horizons and Interzone. For starters, here are four quotes that capture the essence of the argument, with links to the original texts. Clicking the links is worth your while, as the original pieces are extremely well written, differ in their opinions on the book in crucial respects, and all have a number of valid, lucid insights. I have no intention to go into all arguments, and do not claim these quotes represent the texts in full. They do however show a convergence over at least one point of criticism, a point I do want to examine thoroughly. There is some talk along the lines of ‘war makes monsters of us all’, but given that the vast bulk of what passes for action in Ninefox Gambit results in the impersonal destruction of literally millions of people, I’d say not enough. Tl;dr: According to these 3 writers, it’s (morally) problematic to write about violence by showing that violence without incorporating a focus on the suffering of the individual victims. It might even be (morally) problematic to enjoy such literature. Not that I don’t have strong opinions on ethics and literature. One of my reviews that still gets quite some hits is about Haldeman’s The Forever War. I wrote that book can be morally faulted because in it Haldeman not once accepts his own responsibility as a soldier in the Vietnam war – yet the book is often heralded as one of the most important novels written about Vietnam, and that’s including the non-SF books about Vietnam. I elaborate my views in a discussion in the comments as well. There’s an obvious but important difference between Yoon Ha Lee’s novels and The Forever War: YHL himself didn’t participate in real life slaughter. Then again, both authors do have a stake in ethics: Haldeman by portraying himself as a victim of American empire too (sadly without acknowledging the suffering of the Vietnamese), and Yoon Ha Lee because he has explicitly stated his books are about military ethics, like in this fragment of an Ask Me Anything on Reddit. Before we get to the core of the bold ethical statement, it’s also worth noting that the questions raised by McCalmont, Allan and AM are partly a matter of taste, and they all acknowledge in their reviews military SF is not really their cup of tea (anymore). Having said all that, do Yoon Ha Lee and his readers have a moral problem? I don’t think so. I think the real problem is the sanctimonious tone of these 3 members of the Thought Police. Who dares to say Yoon Ha Lee himself is “entertained and/or unmoved by action and violence against others” – to put a face to such a “faceless” denominator as “society” “we live in”? Yoon Ha Lee indeed writes about state violence and its ethical problems. He is clearly opposed to imperialistic systems. All three reviewers acknowledge this. The beef is not with Lee’s goals. The beef is with the method. The method is partly entertainment: Yoon Ha Lee wrote a space opera, not a naturalistic account of a future space war. Is it immoral to be entertained by (fictional) violence, and use such entertainment to try and make readers think about certain ethical questions? What’s the best method to change people’s minds? Does literature even have significant power in changing enough minds to make a noticeable difference in the real world? Save one life? To get people to vote differently? Who actually reads outside their own bubble? What’s the record for American literature as a whole on that matter in the last 5 decades? And who claims to have any sociological, scientific proof on the matter, aside from the best kind of argument in any debate: the hunch? McCalmont, Allan and AM’s accusations are surly and heavy-handed with the veneer of those well-read and soft-spoken. Yoon Ha Lee does not “fetishize” violence: there is no excessive or irrational attention to violence in both books. Something is not excessive or irrational simply because the victims are faceless for the most part. More importantly: it is not at all sure naturalistic, explicitly emphatic accounts of violence have more real world ethical effects than Lee’s approach. On the contrary, in some cases they even might have less. I would think – as it is often in life – there are different roads to the same goal. Some people might be put off by the kind of books McCalmont, Allan and AM would prefer. Not every reader has the stomach to read about the emotional horrors of violence. “‘[H]uman’ covers a lot of ground” Yoon Ha Lee has Jedao say in Raven Stratagem. For that matter, it could be just as easily argued that there are ethical problems with The Underground Railway too – a book that Megan AM and McCalmont reviewed positively (Allan did not review it for the Shadow Clarke jury). Admittedly, Ninefox Gambit and Raven Stratagem‘s main focus is not characters. They are more about systems than people; and people trapped in systems, rather than emotions trapped in people. In an ideal world, there is room for such diversity in literature. My advice would be to stop the progressive infighting. This is just another example of the point made in a book I’ve read 15 years ago and that got a whole lot of new readers after Trump’s election. In Achieving Our Country: Leftist Thought in Twentieth Century America Richard Rorty argues the decline of the left is mainly do to infighting. McCalmont, Allan and AM are iterations of the priests of old that stress PURITY of thought. Well, excuse me. I occasionally like exploding stuff, laser blasts and intricate assassination plots. I even like watching gruesome action scenes in movies about wars that really happened. I shouldn’t be morally shamed for that. Entertainment is important, as it alleviates stress and replenishes the soul – even if it’s in a bath of violence. Entertainment helps me keep up my real life ethical praxis. I have no need for the moral guidance of a contemporary Index Librorum Prohibitorum to determine what books are worthy entertainment. There is obviously a big difference between having some primal urges tickled by movies and books – wether it is abstract & dehumanized or wether it’s maxed out for character depth – and getting a kick out of the real deal of human suffering, let alone causing suffering. This difference is so obvious that it is frankly baffling that what is essentially a matter of taste is confused with moral dictum. I suspect philosopher Terence Blake is right when he wrote of the political correctness of this entire matter in his defense of 9FG on his blog Xeno Swarm, with a follow up post here. And finally, to turn the tables… It’s also a form of naive hubris, as if true suffering really can be represented by fiction. Really really. How much is enough? What percentage of the victim characters should be represented to be absolved? Readers should not believe writers have those kind of superpowers. Expecting so in effect downplays the suffering, and that’s a moral problem too. Or didn’t they read Adorno? Not as good as the first book, but different enough to not just be a sequel. Still good though. More focus on political machinations. There’s significantly less of the poetry I liked in 9FG. There’s a lot more info on the world building. A form of ‘depth’, so you will. Good pacing. Almost a page turner. Lots of stuff on duty. Military ethics, indeed. But I agree with Megan AM: no spectacular new insights. Well constructed as a story though. Fairly standard characterization. Can’t have both lots of plot/world depth and deep characters in 355 pages. Not super superficial however. Again good on gender. Not in a superficial showy marketable way. The entire story hinges on the underestimating of a lower/different/exploited class of ‘others’ by the dominant class. Is that enough as a moral lesson? I’m eager to read Revenant Gun, the third and final book. It will come out on June 12th, that’s a week from now. It’s set a decade after the events in Raven Stratagem. UPDATE 2018/6/13 — The Quill To Live blog just published an interview with YHL, of which his answer to the final question explicitely talks about his choice of focussing on depicting soldiers in this trilogy, and not other people. It’s here. This entry was posted in Reviews and tagged 2010s, Arthur C. Clarke Shadow Jury, Ethics, Jonathan McCalmont, Megan AM, Nina Allan, Raven Stratagem, Review, Science Fiction, The Machineries Of Empire, Yoon Ha Lee. Bookmark the permalink. Thanks! Yes indeed, it all boils down to artistic choices and goals. You can’t have everything in a work of art. I hope you’ll like 9FG, but my advice is not to get too much hope, as that could kill it. I’ve ogled this book often in the book stores but always put it back with a sigh. I remember almost nothing from Ninefox Gambit and that is because I couldn’t form a picture in my head of anything that was happening, and I can’t be bothered to read it again. I half-agree with you. I was very impressed by NINEFOX GAMBIT, but I think I was reacting to the conceptual world-building and the stylistic pyrotechnics of the beginning, that were pseudo-visual leaving as you say no lasting picture. I was disappointed by RAVEN STRATAGEM but still found it worth reading, and I will read REVENANT GUN as soon as it comes out, but without high expectations. It’s interesting you both agree on the fact that YHLs book did not leave a lasting picture. It did not really strike me, but in that Reddit AMA I read afterwards Lee says he has aphantasia – “a condition where one does not possess a functioning mind’s eye and cannot voluntarily visualize imagery”. It’s not really a problem to pick up RS if you forgot half of 9FG. It was more than a year ago since I read that, and I forgot a lot too. YHL manages to get the relevant stuff back quickly, and as I said, it’s a lot more clear on world building, so it’s a lot less ‘difficult’ book as 9FG. This is a very clear and very well argued post. Even if we suppose that there are ideological presuppositions ingrained into the basic conventions of military space opera I think that NINEFOX GAMBIT does a better job of critiquing and subverting them from inside than the Shadow Clarke Jury does from without. Given that Yoon Ha Lee is not actually arguing in favour of mass murder as motivational background to élite individuals’ life choices, I don’t think that there is any moral difference between him and the Shadow Clarke jury. The difference is stylistic and rhetorical rather than moral. SF tropes are not meant literally, and if you do take them literally, as the Sharkes do, then you can generate facile but wrong-headed critical readings. Nor do they disagree over the politics (war is bad, democracy is good, masochistic “remembrances” are bad, free conscience is good). Given the large terrain of agreement, your diagnosis of “infighting” hits the mark. The defining tropes and conventions of the Sharke Jury seem to be flawed in that it is set up as a form of bad conscience judging both the original jury and its selected works in the name of moral dicta and political criteria. Thank you, much appreciated. The attitude of the Sharkes is strangely reminiscent of conservative people blaming Marilyn Manson’s lyrics for Columbine, or blaming violent video games for gun violence, as if there is no important gap between fiction and reality. I get it, ‘all art is politics’ as the Sharkes would say, but that doesn’t mean the gap is not relevant in judging the political merit of art. The more the Left fights its own *insert derogatory term of your choice*, the happier I am…. I’m not surprised, and no problem. But this issue comes down to how and why humans behave, and that fall squarely into the realm of the theological and not at all into the political arena. Pingback: 2018 FAVORITES | Weighing a pig doesn't fatten it.